A taxi dancer is a paid dance partner in a partner dance. Taxi dancers are hired to dance with their customers on a dance-by-dance basis. When taxi dancing first appeared in taxi-dance halls during the early 20th century in the United States, male patrons would typically buy dance tickets for a small sum each. When a patron presented a ticket to a chosen taxi dancer, she would dance with him for the length of a single song. The taxi dancers would earn a commission on every dance ticket earned. Though taxi dancing has for the most part disappeared in the United States, it is still practiced in some other countries. The term "taxi dancer" comes from the fact that, as with a taxi-cab driver, the dancer's pay is proportional to the time he or she spends dancing with the customer. 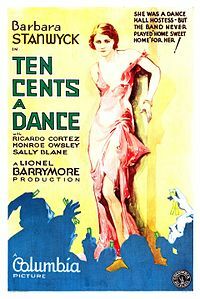 Patrons in a taxi-dance hall typically purchased dance tickets for ten cents each, which gave rise to the term "dime-a-dance girl". 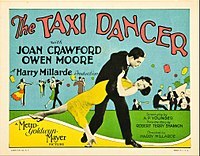 Other names for a taxi dancer are "dance hostess", "taxi" (in Argentina), and "nickel hopper" because out of that dime they typically earned five cents. Taxi dancing traces its origins to the Barbary Coast district of San Francisco which evolved from the California Gold Rush of 1849. In its heyday the Barbary Coast was an economically thriving place of mostly men that was frequented by gold prospectors and sailors from all over the world. That district created a unique form of dance hall called the Barbary Coast dance hall, also known as the Forty-Nine['49] dance hall. Within a Barbary Coast dance hall female employees danced with male patrons, and earned their living from commissions paid for by the drinks they could encourage their male dance partners to buy. Still later after the San Francisco Earthquake of 1906 and during early days of jazz music, a new entertainment district developed in San Francisco and was nicknamed Terrific Street. And within that district an innovative dance hall, The So Different Club, implemented a system where customers could buy a token which entitled them to one dance with a female employee. Since dancing had become a popular pastime, many of The So Different Club's patrons would go there to see and learn the latest new dances. However in 1913 San Francisco enacted new laws that would forbid dancing in any cafe or saloon where alcohol was served. The closure of the dance halls on Terrific Street fostered a new kind of pay-to-dance scheme, called a closed dance hall, which did not serve alcohol. That name was derived from the fact that female customers were not allowed — the only women permitted in these halls were the dancing female employees. The closed dance hall introduced the ticket-a-dance system which became the centerpiece of the taxi-dance hall business model. A taxi dancer would earn her income by the number of tickets she could collect in exchange for dances. I was in New York during the summer of 1919, and while there visited a new studio opened by Mr. W___ W___ of San Francisco, where he had introduced a ten-cent-ticket-a-dance plan. When I got home I kept thinking of that plan as a way to get my advanced students to come back more often and to have experience dancing with different instructors. So I decided to put a ten-cent-a-lesson system in the big hall on the third floor of my building... But I soon noticed that it wasn't my former pupils who were coming up to dance, but a rough hoodlum element from Clark Street... Things went from bad to worse; I did the best I could to keep the hoodlums in check. This system was so popular at dance academies that taxi-dancing system quickly spread to an increasing number of non-instructional dance halls. Taxi dancers typically received half of the ticket price as wages and the other half paid for the orchestra, dance hall, and operating expenses. Although they only worked a few hours a night, they frequently made two to three times the salary of a woman working in a factory or a store. At that time, the taxi-dance hall surpassed the public ballroom in becoming the most popular place for urban dancing. Taxi-dance halls flourished in the United States during the 1920s and 1930s, as scores of taxi-dance halls opened in Chicago, New York, and other major cities. In 1931 there were over 100 taxi-dance halls in New York City alone, patronized by between 35,000 and 50,000 men every week. However, by the mid 1920s, in New York City and other towns and cities across the United States, taxi-dance halls were coming under increasing attack by reform movements who deemed some establishments dens of iniquity, populated mainly by charity girls or outright prostitutes. Reform in the form of licensing and police supervision was insisted on, and eventually some dance halls were closed for lewd behavior. In San Francisco where it all started, the police commission ruled against the employment of women as taxi dancers in 1921, and taxi dancing in San Francisco would forever become illegal. After World War II the popularity of taxi dancing in the United States began to diminish, and most of its taxi-dance halls disappeared by the 1960s. In 1932, The University of Chicago Press published Paul G. Cressey's sociological study on taxi dancing. Published as The Taxi-Dance Hall: A Sociological Study in Commercialized Recreation and City Life, the study utilized vivid, firsthand interviews of taxi dancers and their patrons to expound on the history and social milieu of the taxi dance hall. The book is now considered one of the classic urban ethnographies of the Chicago School. The typical taxi dancer in the 1920s and 30s was an attractive young woman between the age 15 and 28 who was usually single. Although some dancers were older, the taxi-dancer profession skewed strongly toward the young and single. A majority of the young women came from homes in which there was little or no financial support from a father. They were occasionally runaways from their families, and it was not unusual for a taxi dancer to be from a home where the parents had separated. Despite their relatively young age range, a sizeable percentage of taxi dancers had been previously married. Many times the dancers were immigrants from European countries such as Poland, Sweden, the Netherlands, Germany, and France. Various cultural conflicts would arise between parents and their dancing offspring, especially if the parents were from rural areas. For dancers of an immigrant family, the dancer was often the financial support of the family. When a girl supplanted the parent or parents as breadwinner, sometimes the dancer would assume an aggressive role in the family by "subordinating the parental standards to her own requirements and demands". These conflicts in values between dancers and their parents frequently caused the dancers to lead so-called "double lives", denying that they worked at a taxi-dance hall. To further this divide, the girls would sometimes adopt aliases so that their activities might not reach their families' ears. When parents found out, there were three typical outcomes—the girl gave up her dancing career, the girl left home and became estranged from the family, or the family accepted the girl's conduct, however reluctantly, due to financial necessity. Despite the frequent hardships, many dancers seemed to enjoy the lifestyle as they adopted a pursuit of what Cressey calls "money, excitement, and affection." During his research and interviews, Cressey found many taxi dancers who spoke favorably about their experiences in the taxi-dance hall. I was working as a waitress in a Loop restaurant for about a month. I never worked in a dance hall like this and didn't know about them. One day the "boss" of this hall was eating in the restaurant and told me I could make twice as much money in his "dancing school." I went there one night to try it – and then quit my job at the restaurant. I always liked to dance anyway, so it was really fun. After I had gotten started at the dance hall I enjoyed the life too much to want to give it up. It was easy work, gave me more money than I could earn any other way, and I had a chance to meet all kinds of people. I had no dull moments. I met bootleggers, rum-runners, hijackers, stick-up men, globe-trotters, and hobos. There were all different kinds of men, different from the kind I'd be meeting if I'd stayed at home with my folks in Rogers Park... After a girl starts in the dance hall and makes good it's easy to live for months without ever getting outside the influence of the dance hall. Take myself for instance: I lived with other dance-hall girls, met my fellows at the dance hall, got my living in the dance hall. In fact, there was nothing I wanted that I couldn't get through it. It was an easy life, and I just drifted along with the rest. I suppose if something hadn't come along to jerk me out, I'd still be a drifter out on the West Side. Since the 1920s, when taxi dancing boomed in popularity, various films, songs and novels have been released reflecting the pastime, often using the taxi-dance hall as a setting or chronicling the lives of taxi dancers. Taxi dancers may dance among paying customers to raise the standard or dance among the beginners to encourage them to continue learning. In the latter situation, taxi dancers often provide their services, without pay, with the general goal of building the dance community. In social settings and social forms of dance, a partner wanting constructive feedback from a taxi dancer must explicitly request it. As the taxi dancer's role is primarily social, she is unlikely to criticize her partner directly. Due to the increased profile of partner dances during the 2000s, taxi dancing has become more common in settings where partners are in short supply, involving male and female dancers. For example, male dancers are often employed on cruise ships to dance with single female passengers. This is usually called Dance Host. Taxi dancers (male and female) are also available for hire in Vienna, Austria, where dozens of formal balls are held each year. Volunteer taxi dancers (experienced male and female dancers) are used in dance styles such as Ceroc to help beginners. Paying to dance with a female employee is available in some nightclubs of the United States, including many in Los Angeles. These clubs no longer use the ticket-a-dance system, but have time-clocks and punch-cards that allow the patron to pay for the dancer's time by the hour. Some of these modern dance clubs operate in buildings where taxi dancing was done in the early 20th century. No longer called taxi-dance halls, these latter-day establishments are now called hostess clubs. For official purposes, in the United States their occupation was sometimes referred to as a 'dancer', when they worked in taxi-dance halls that had all the necessary business permits. But there were some professional secretaries who were moonlighting and legally worked part-time as a dancer. The growth of tango tourism in Buenos Aires, Argentina, has led to an increase in formal and informal taxi dancing services in the milongas, or dance halls. While some operators are trying to sell holiday romance, reputable tango taxi agencies offer genuine services to tourists who find it hard to cope with the cabeceo—eye contact and nodding—method of finding a dance partner. Freeland, David. Automats, Taxi Dances, and Vaudeville: Excavating Manhattan's Lost Places of Leisure. (New York: NYU Press, 2009). ISBN 0814727638. Cressey, Paul G. The Taxi-Dance Hall: A Sociological Study in Commercialized Recreation and City Life. (Chicago: The University of Chicago Press, 1932; 2002). ISBN 9780226120515. Stoddard, Tom. Jazz On The Barbary Coast. (Berkeley, CA: Heyday Books, 1982). ISBN 189077104X. Montanarelli, Lisa; Harrison, Ann. Strange But True San Francisco: Tales of the City by the Bay. (Guilford, Connecticut: Globe Pequot Press, 2005). ISBN 076273681X. Asbury, Herbert. The Barbary Coast: An Informal History of the San Francisco Underworld. (New York: Garden City Publishing Co., 1933; Basic Books, 2002). ISBN 1560254084. Knowles, Mark. The Wicked Waltz and Other Scandalous Dances. (Jefferson, North Carolina & London: McFarland & Company, Inc., Publishers, 2009). ISBN 0786437081. Anonymous. Confessions of a Taxi Dancer. (Detroit: Johnson Smith & Co., 1938). Ross, Leonard Q. The Strangest Places. (New York: Harcourt, Brace and Company, Inc., 1939). Salerno, Roger A. Sociology Noir: Studies at the University of Chicago in Loneliness, Marginality and Deviance, 1915-1935. (Jefferson, North Carolina & London: McFarland & Company, Inc., Publishers, 2007). Field, Andrew David. Shanghai's Dancing World: Cabaret Culture and Urban Politics, 1919–1954. (Hong Kong: The Chinese University Press, 2010). ^ Cressey (1932), p. 3, 11, 17. ^ Burgess, Ernest (1969). "Introduction". The Taxi-Dance Hall:A Sociological Study in Commercialized Recreation and City Life. Montclair,NJ: Paterson Smith Publishing. pp. xxviii. ISBN 0875850766. ^ Freeland, David. Automats, Taxi Dances, and Vaudeville: Excavating Manhattan's Lost Places of Leisure. (New York: NYU Press, 2009), p. 192. ^ Asbury, Herbert. The Barbary Coast: An Informal History of the San Francisco Underworld. (New York: Basic Books, 2002), p. 3. ^ Cressey (1932), p. 179. ^ Knowles (1954), p. 64. ^ Asbury (1933), p. 99. ^ Stoddard, Tom. Jazz On The Barbary Coast. (Berkeley, CA: Heyday Books, 1982), p. 10. ^ Stoddard (1982), p. 13. ^ Richards, Rand (2002). Historic Walks in San Francisco. San Francisco: Heritage House Publishers. p. 183. ISBN 1879367033. ^ Asbury (1933), p. 293. ^ Asbury (1933), p. 303. ^ Cressey (1932), p. 181. ^ Cressey (1932), p. 183. ^ Cressey (1932), p. 184. ^ Cressey (1932), p. 3. ^ Cressey (1932), p. 12. ^ Cressey (1932), p. xxxiii. ^ Ronald VanderKooi, University of Illinois at Chicago Circle, March 1969. ^ Freeland (2009), p. 190. ^ Freeland (2009), p. 194. ^ Cressey (1932), p. 182. ^ Clyde Vedder: Decline of the Taxi-Dance Hall, Sociology and Social Research, 1954. ^ Fritz, Angela. "I was a Sociological Stranger’: Ethnographic Fieldwork and Undercover Performance in the Publication of The Taxi‐Dance Hall, 1925–1932" Gender & History, Vol. 30, No. 1, March 2018, pp. 131–152. ^ Cressey, Paul G. The Taxi-Dance Hall: A Sociological Study in Commercialized Recreation and City Life ((Montclair, NJ: Patterson Smith, 1969), pp. 33–37.